Set deep in the heart of the Greenlandic wilderness, there’s a fairy tale quality to this camp which is totally unique in Greenland; a handful of tall, canvas tepees pitched in a remote location overlooking magical fjords, where whales, seals and sea eagles are regular visitors. Although this isolated spot can only be reached by boat, the camp is far from basic and has proved comfortable enough for Jordanian royalty. The tall tents sit on wooden platforms and are fitted out with proper beds, lighting, heating and plenty of sheepskin rugs and furs to wrap up in at the end of a long day exploring. With a maximum of just 12 guests, the personalisation offered by the local hosts is remarkable. A private guide will take Swoop’s guests to explore the magical scenery by foot, trekking to spectacular views over the ice, or they can take to the water, visiting tiny, traditional Greenlandic villages where colourful, painted houses hug the coastline and the locals retain age-old traditions. Opportunities to fish for cod and char, kayak among the ice, watch whales or even swim in icy waters are ever present. Or, of course, guests can just sit back and relax! Back at the camp, award-winning chef, Bjorn, serves up tasty meals, including the guests’ freshly caught cod, prepared with herbs foraged locally. What could be better than sitting around an open camp fire underneath unpolluted night skies, with the cleanest air quality of almost anywhere in the world and a silence that is broken only by the sound of icebergs breaking into smaller pieces? Greenland is the planet’s largest island, more than 80 percent of which is covered by the ice sheet. It also has the world’s smallest capital city, very few roads; no trains and is the least densely populated territory on Earth. As such, its vast landscape of fjords, glaciers, mountains and tundra provides the perfect backdrop for outdoor living and exploration. To experience all of this in such comfort is incredible! 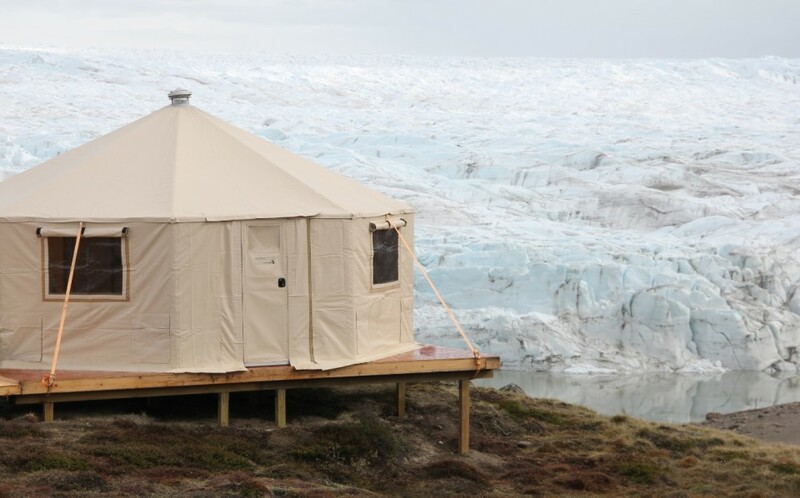 Four, five and seven-day Luxury Glamping in Greenland breaks are available with prices starting from £2560 per person. This covers return transfers by private boat between Nuuk and the camp, full board tented accommodation, a speed boat cruise through the fjords, visits to local communities, guides throughout the trip, the use of specialist outer clothing and all activities mentioned including equipment. The team at Swoop is passionate about the ends of the earth. Less travel agent, more destination ambassador, the specialist company focuses exclusively on arranging adventures in the Polar Regions and Patagonia. Offering extensive knowledge and experience gained from living, working and travelling in these regions, combined with a wide choice of options available through its long-standing relationships with tour operators and local partners, Swoop helps to plan trips that match individuals’ dreams, budgets and appetite for adventure.